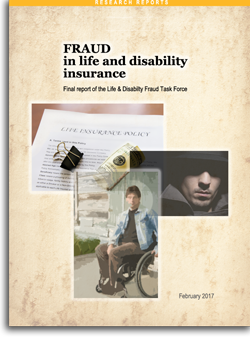 WASHINGTON, April 12, 2017 — Combating fake deaths, murdered spouses and phony work injuries appears inconsistent and often under-resourced, reveals a new report on life and disability scamming issued by the Coalition Against Insurance Fraud. The survey is among the first to map crime trends in both lines — and detail how fraud fighters are responding. A Coalition task force surveyed insurers, fraud bureaus and prosecutors throughout both lines. More than 350 fraud cases also were reviewed. Overall, fraud appears less of a problem or focus in life and disability when compared to auto, workers compensation and health, the report notes. Organized rings and underwriting scams, however, especially concern life insurers. Gypsy rings, and Russian and Armenian groups were among the frequent ring fraudsters listed. Fraud by organized rings was labeled severe or moderate by 80 percent of life insurers surveyed. Thirty percent also labeled underwriting fraud severe. Disability scams overall appear more moderate in scope and anti-fraud focus than in life insurance. Faking painful injuries and under-reporting income are the most-severe challenges for disability insurers. These schemes still ranked only moderate. Underwriting and dead-money scams came in well behind. Life. Most life insurers seek policy rescission. Some 67 percent routinely present cases to fraud bureaus and prosecutors. They also follow up and build personal relationships. Disability. Only 29 percent of disability investigations led to adverse decisions — compared to 50 percent for property-casualty cases. No disability insurers pursue policy rescission or civil litigation — or routinely send cases to fraud bureaus. The average SIU has six employees. Create collaborative teams that regularly meet to discuss fraud trends and refine strategy. Increase funding and authority allowing state fraud bureaus to take on more life and disability cases. Note: The full report can be downloaded here.